Henhouse Confessions: Critter Identified/Great Compost Bin Found!! Pretty much just my rantings about my yard. Feel free to read it if that interests you. Critter Identified/Great Compost Bin Found!! Most mornings the lid is off & there is debris spread out over my yard. Ugh. I tried putting a brick on the lid, but that didn't work. I put a cinder block on there and the whole bin was pushed a few feet over, with a little trail of compost coming out the bottom. I tried leaving my dog door open later so my dog could go out & maybe scare away critters, but that didn't help. 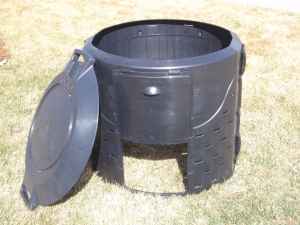 I tried keeping food scraps out of the bin for a while, only putting yard clipping in it. Still got broken into & spread around! Who does that?!??! So I decided to stalk the little culprit & see who he or she was. So- he can open the bin and push the bin. This is not good. I began searching online for solutions. 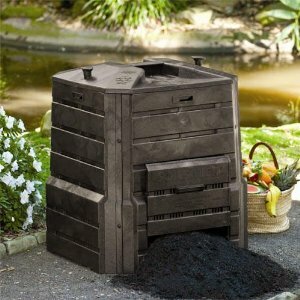 Turns out when you type "dog proof compost bin" into search engines, you get a lot of information on composting dog poop! Who knew? Amazingly, also some information on composting human poop! That is apparently common enough that it has it's own name: Humanure. News to me, and although I do try to be green, not something I feel like trying yet. OK, back to the dog issue - I found a great, sturdy, *securely* latching bin that even my dog (who, it turns out, may as well have thumbs) can't break into! He did push it a couple of feet once, but only when it was mostly empty. Now it's too heave for him. Success! It's called the SoilSaver, and so far I am super happy with it! Note - that is not my yard in the background, my yard is way more chaotic than that. I have a yard! So I can grow fruits & vegetables, let my dog run around, let my cats lie in the sun, let my chickens peck around & eat snacks, and enjoy it all! Among other things. I'm blogging here partly for myself, as a journal of my efforts (mostly trial & error) and also in case any skilled gardeners happen to read this and have good suggestions for me, since half the time I feel like I'm making it up as I go!